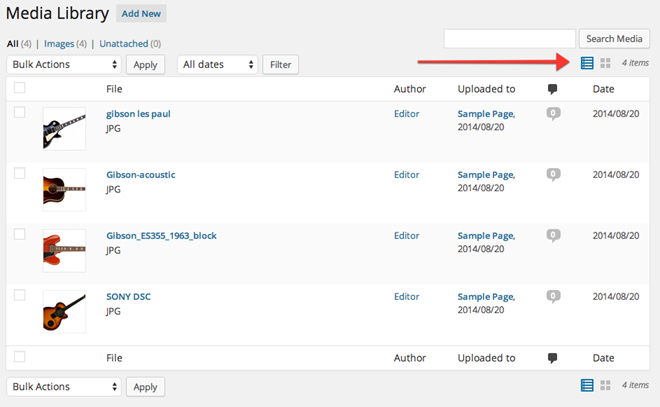 By default, the Media Library lists all the media that has been uploaded into the system in a Grid View. The Media Library lists all the media that have been uploaded into the system. Whether you upload media directly into pages or posts or into the media library, once any media has been uploaded into the system it will be available for you to use in the media library. Once the media is in the media library it can be used on any page or post throughout the site. At the top left of the Media Library screen, your media is sorted into type and tallied to give you a quick reference as to how much media, and what type of media, are available for you to use. Clicking on any of these headings will filter the list to media of that type only. At the top right of the screen there is a handy Search bar allowing you to search the Media Library for any files containing particular words. Underneath the Search bar is the number of Items the Media Library currently have. Technical: This search function will search the file names, titles and descriptions of all files in the library. Directly beneath the media type headings and search bar is the Bulk Actions drop down menu, which essentially allows you to delete multiple files at once as previously explained. Next to the Bulk Actions menu is a date filter that allows you to filter the media list to media uploaded in a certain month. Simply choose the date you require from the drop down list and click on the Filter button. Below the bulk actions and filter tools is the list of media. The list displays a thumbnail of the media file, the file name and type, the author who uploaded the media, any pages or posts the media file is currently attached to, any comments on those pages or posts, and the date the media were uploaded. Media that are not an image will show a generic thumbnail for that media type. For example, Audio will show a thumbnail of musical notes, and Video will show a thumbnail of a clapperboard with a play button. Clicking on the page or post in the "Attached to" column will take you to the Edit screen for that page or post. Clicking on the comments icon will take you to the Edit screen, which is covered in more detail later. Placing the mouse over the media file thumbnail or name will display the Options menu, allowing you to Edit or Delete Permanently the media file or View the media file as its own post.